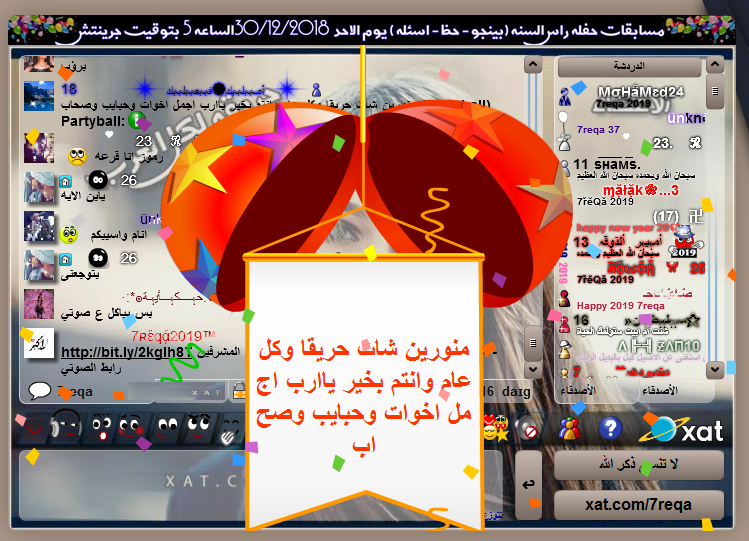 Win 5000 xats And 100 Days (New Year event 30/12/2018) Arabs :D ! i would like to Announce that 7reqa Group Chat will celebrate the New Year 2019 For all Arabic Poeple (but all poeple can come to celebrate the new year with us) . This giveaway will include Xats And Days . Everyone will have a chance to win. all winners will be posted here on the forum! Good luck everyone and God Bless! متل ما عودكم شات حريقه دائما وابدا الصداقة و المسابقات ..
المسابقة بشات حريقة والجوائز بقيمة 5000 اكسات و 100 أيام.. Happy New Year To ALL ..
You will allow only Arabic language? Thanks for this event as well. Yes but everyone can come to celebrate with us the new year (other language are allowed) but the events will be hosted in arabic language only .. This event is not random ID. anyway welcome everyone to celebrate the new year together . Any ask for you... Gamebot play? all of those participating, Happy New year in advance as well.